From I-805 North or South go East on Mira Mesa Blvd, from I-5 South use I-805 South to Mira Mesa Blvd, from I-5 North exit Sorrento Valley Road which turns into Mira Mesa Blvd as you pass under I-805, from I-15 head West on Mira Mesa Blvd. 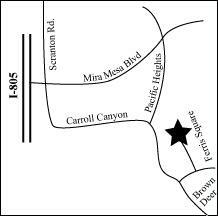 Once on Mira Mesa Blvd turn south on Pacific Heights (Scranton Rd). Turn left onto Carroll Canyon Rd. Turn left on Brown Deer then left on Ferris Square. Go to the end and look to the left for 6255 Suite E.
Trade Policy: Bass San Diego is happy to consider trades for basses we have previously sold, or for basses from manufacturers with whom we currently work. Bass San Diego will not accept basses for trade that we did not sell, or basses from manufacturers with whom we do not currently work. Return Policy: Naturally, we hope your purchase exceeds your expectations. But if it doesn't, take comfort in the knowledge that BSD has your back. You always have 48 hours from receipt of your equipment to play it and determine if it's going to meet your needs. If it doesn't simply pack it securely in the box we shipped it in, and ship it back to us. Once we receive it and inspect it, we'll arrange for a full refund (excluding shipping, of course). If you have any questions about this policy, give us a call. Quote Policy: All quotes are good for a period of 48 hours from the time the quote was given. Exceptions to this policy are made at the sole discretion of Bass San Diego. Call us if you have any questions about this policy. Consignment Sales: Bass San Diego offers consignment services for equipment that we have previously sold or equipment with which we are familiar. We will only consider instruments with a value above $2000.00. We will not accept amplifiers on consignment that we did not originally sell without prior inspection. Consignment fees are 25% of the final sale price. Questions? Call us! Special Orders and Custom Orders: Bass San Diego wants to help you build your dream bass and we'll be with you every step of the way. We require at least 25% of the final purchase price as a deposit. If you place an order and cancel it, you forfeit your deposit. All deposits are non-refundable. Please contact us if you have any questions about this policy. Shipping Policy: Shipping quotes include a container and packing materials. "Free shipping" applies ONLY to the continental United States. Additional shipping charges may apply to orders originating from Alaska, Hawaii or international locations. Questions? Give us a call.